On January 2, 2018, CEE Legal Matters reported that Czech pharmacy chain Dr. Max acquired the entire A&D Pharma network in Romania, in a transaction that has been shortlisted for CEE Deal of the Year 2017 in the country. While the transaction awaits approval from authorities, we reached out to Ivo Senkyrik, Head of Group M&A at Dr. Max, to find out how his team made the deal happen. Andrzej Posniak started his career in law at CMS in 2003 as a corporate trainee and, step by step, become a qualified tax advisor, then a Partner and Head of the Tax Team in CMS Warsaw's Corporate Department. In addition, Andrzej also fulfills General Counsel and Risk Manager roles for the firm in Poland. CEE Legal Matters sat down with Andrzej to learn more about his unique role. Hungarian lawyer Peter Paroczi is the Director Counsel at Harman International, the US-based consumer electronics company. He joined Harman in Budapest earlier this year, after spending four years in private practice and then another seven in-house, first with Samsung Electronics, then at E.On. He agreed to answer some of our questions about his career. In the modern world, people are regularly faced with new challenges. We are now only two days away from the Hungary General Counsel Summit. CEE Legal Matters spoke with Erika Papp, Partner and Head of Banking and International Finance, Hungary with CMS, one of the sponsors of the conference to hear her thoughts on the upcoming event. Who knows more about lawyers than other lawyers? 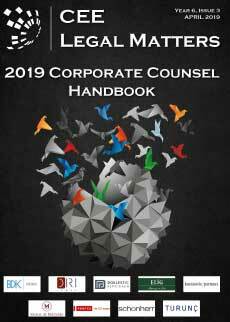 In the Face-to-Face feature, we step back and allow private practitioners to sit down directly with in-house counsel to discuss their challenges, strategies, and solutions. ODI Law Firm Partner Matjaz Jan interviews Miha Ursic, the General Counsel of HIT d.d. in Slovenia for CEE Legal Matters’ Face-to-Face. The Future is Almost Here: Are We Ready? Even though we have not yet reached the speed of light, the future is almost here. In a challenging economy, in-house lawyers face higher expectations from their clients. On one hand, legal costs are usually seen by businesses as a strong candidate for potential savings. With that in mind, in-house counsels must navigate budget limitations through different measures, including curbing external spend. After the failed military coup in Turkey on July 15th, 2016, The Council of Ministers of Turkey declared a State of Emergency (SoE) in the country. This article focuses on the position of a GC when suddenly confronted with a SoE, needing to ensure the transformation of the company to ensure compliance with the SoE regime. Our world is changing in front of our eyes. The political situation seems to those of us living in developed countries as experiencing the most rapid changes since the fall of communism. Regulating an effective budget for a legal department is a major strategic decision that must be considered by companies and their legal counsel.